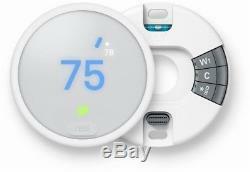 NEW Nest Thermostat E White 24-Bit Color LCD Screen Smartphone Connectivity. 24-bit color LCD screen (320 x 320). Frosted display blends into the background. Sensors: temperature, humidity, proximity (occupancy), ambient light. 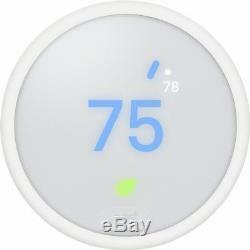 Control your home temperature from anywhere with the free Nest app. Turn itself down after you leave. 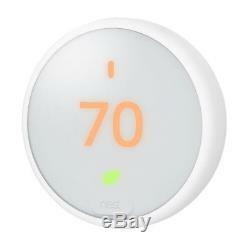 Nest Leaf shows energy-saving temperature. 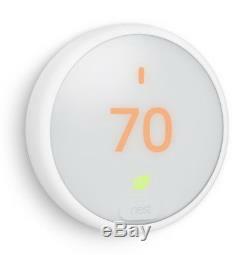 Schedule your home temperature from Nest app. Compatible with most 24V heating and cooling system. Built in rechargeable lithium-ion battery. Box or are outside of the lower 48 states i. If you do not receive your tracking information, please check your spam folder. E-tech Galaxy diligently strives to provide you outstanding electronic products at discounted prices with fantastic customer service. 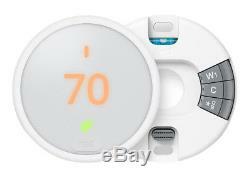 The item "NEW Nest Thermostat E White 24-Bit Color LCD Screen Smartphone Connectivity" is in sale since Monday, January 29, 2018. 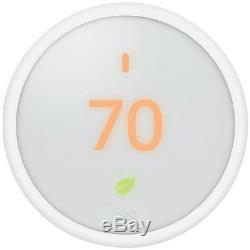 This item is in the category "Home & Garden\Home Improvement\Heating, Cooling & Air\Thermostats\Programmable Thermostats". The seller is "e-techgalaxy" and is located in Fort Worth, Texas. This item can be shipped to United States, Canada, United Kingdom, Denmark, Romania, Slovakia, Bulgaria, Czech republic, Finland, Hungary, Latvia, Lithuania, Malta, Estonia, Australia, Greece, Portugal, Cyprus, Slovenia, Japan, China, Sweden, South Korea, Taiwan, South africa, Thailand, Belgium, France, Hong Kong, Ireland, Netherlands, Poland, Spain, Italy, Germany, Austria, Bahamas, New Zealand, Philippines, Singapore, Switzerland, Norway, Croatia, Malaysia, Chile, Colombia, Costa rica, Dominican republic, Panama, Trinidad and tobago, Guatemala, El salvador, Honduras, Jamaica, Antigua and barbuda, Aruba, Belize, Dominica, Grenada, Saint kitts and nevis, Saint lucia, Montserrat, Turks and caicos islands, Barbados, Bangladesh, Bermuda, Brunei darussalam, Bolivia, Ecuador, French guiana, Guernsey, Gibraltar, Guadeloupe, Iceland, Jersey, Cayman islands, Liechtenstein, Sri lanka, Luxembourg, Monaco, Macao, Martinique, Maldives, Nicaragua, Pakistan, Paraguay, Reunion.